The Barking Crab in Boston. Recently, I’ve been remembering our most recent vacation to Boston. We enjoyed so much fantabulous food from Mike’s Pastry in The North End (another post coming soon) to clam chowder at Legal Seafoods and desserts at Finale. But the best by far was a dinner at The Barking Crab. Flash forward to last year when we saw The Barking Crab on Travel Channel’s “Man v. Food.” Adam Richman traveled to Beantown’s harbor to enjoy their famed clambake. To my surprise, you can find legitimate dining experiences on the docks, harbors and other generally seedy areas. (I’ve come quite a long way in seven years.) In this video, WCVB’s news magazine “Chronicle” takes a peek at The Barking Crab. The Crab is located steps from Boston’s Children’s Museum and just a few blocks from the Financial District. The restaurant has a great patio that can seat lots of diners plus it has a more subdued inside. The cuisine is true New England seafood. If you’re not into crustaceans, you can enjoy their steak or fried chicken as alternatives. But if you want the true experience, splurge on their specialty – the New England Clambake. Four pounds of mouth-watering shellfish including a 1.25-pound lobster or crab legs, mussels, corn-on-the-cob, New England clam chowder, cole slaw and red-skinned potatoes. Download the full food menu. 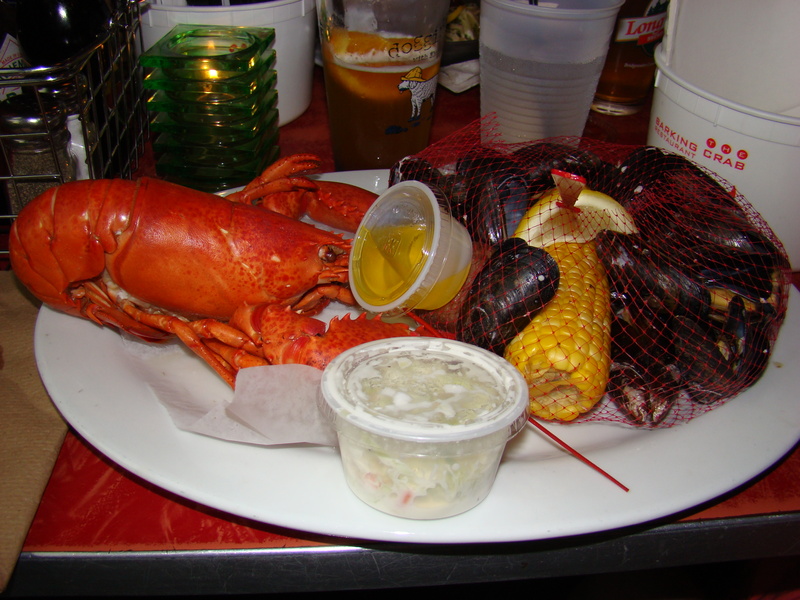 The clambake at the Barking Crab includes a 1.25-pound lobster, mussels, cole slaw and potatoes. Before you start your meal, you can enjoy some of The Crab’s great appetizers like peel ‘n eat shrimp, oysters on the half shell or fried clams. Wash it down with some of Boston’s best brews like Sam Adam’s Summer Ale or The Barking Crab’s White Ale, a special brew created by Harpoon Brewery especially for the restaurant. It’s a light brew that pairs great with seafood. It’s rare that I have three beers with a meal, but this one was well worth it! If you’re not into beer, maybe one of the restaurant’s “guppy bowls” is for you. Download their full beverage menu. We were lucky enough to be joined for dinner by two of our best friends from college – Jake and Stacey. It made for one of the most memorable dining experiences I have ever had! We started off with the oysters on the half shell, a first for Stacey and I, but a must-try if you’re coming to New England. The raw oysters were fresh. I just love that you know that your seafood came off a boat that day when you’re in Boston. Our meals were great. Brett and Jake both enjoyed the clambakes. Brett had the lobster while Jake ordered the crab legs. When our meals came out, we wondered why there was another lobster on Jake’s plate in addition to the crab legs. Our waiter came by and said, “They gave you a lobster, man. Shhh…I won’t tell.” Sweet. A free lobster. Instead of the clambake, I enjoyed the cedar-plank salmon served with seasonal vegetables and potatoes in a garlic, lemon and dill sauce. The fish was flaky and tender. The sauce was subtle, yet added another layer to the fish without overpowering the salmon’s taste. The vegetables and potatoes were good, but nothing that I’d write home about. 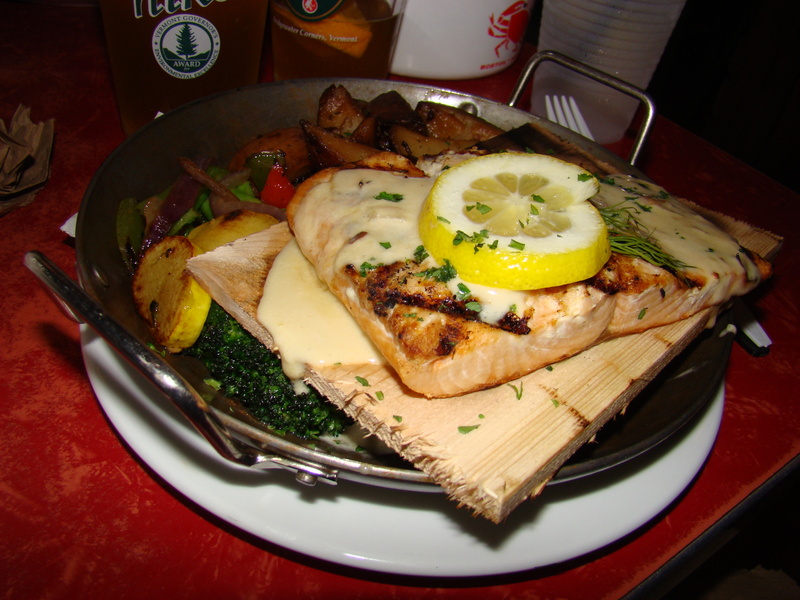 The cedar plank salmon is served with a garlic, lemon and dill sauce. You get your choice of two sides. This was potatoes and grilled, seasonal veggies. 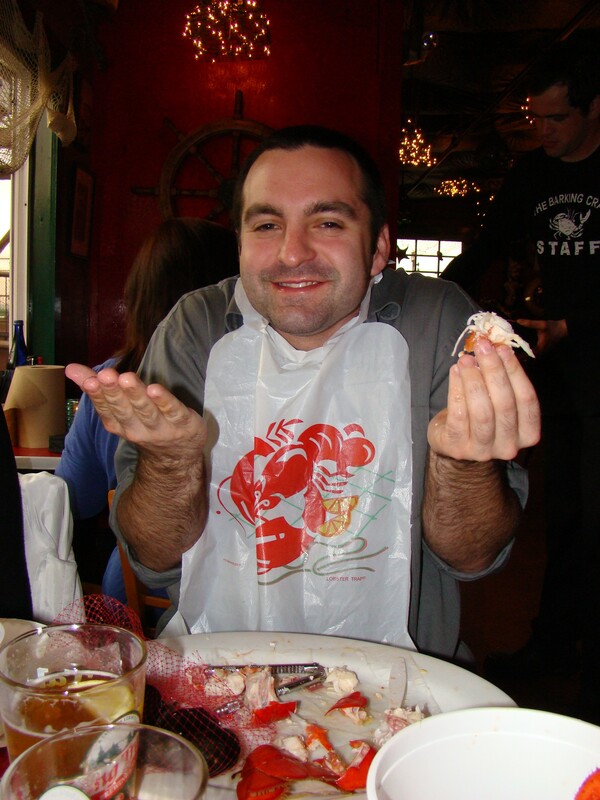 Our friend Jake enjoying his clambake at The Barking Crab. Remembering that Adam Richman saw a 15-pound lobster on Man v. Food, we needed to check out their monstrous lobsters. I had no idea how massive these things could get. It took two waiters to bring a 10-pound lobster to our table. I can’t imagine the meat would be all that tender in a lobster that size, but if anyone has tried it and can disprove that, please let me know. However, the 1.25-pound lobsters were great. They’re fresh, meaty and oh-so-good. You don’t need to slather it in butter. It has a richness on its own that you have to try. 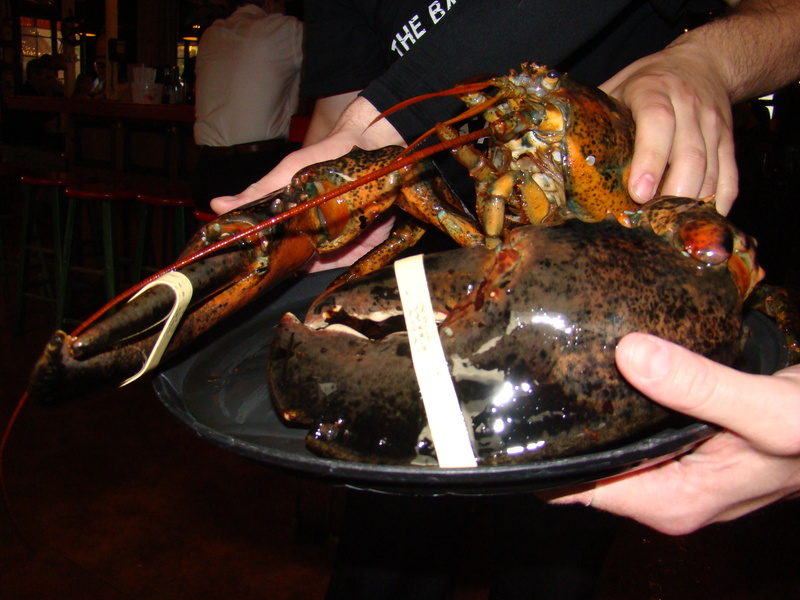 The Godzilla-like 10-pound lobster. Save your children! The prices at The Barking Crab vary from $9 for a chicken sandwich to the market-priced lobster and clambake selection. You can also enjoy soups, salads, pastas and fantastic desserts like cannolis. There’s also a kid’s menu. 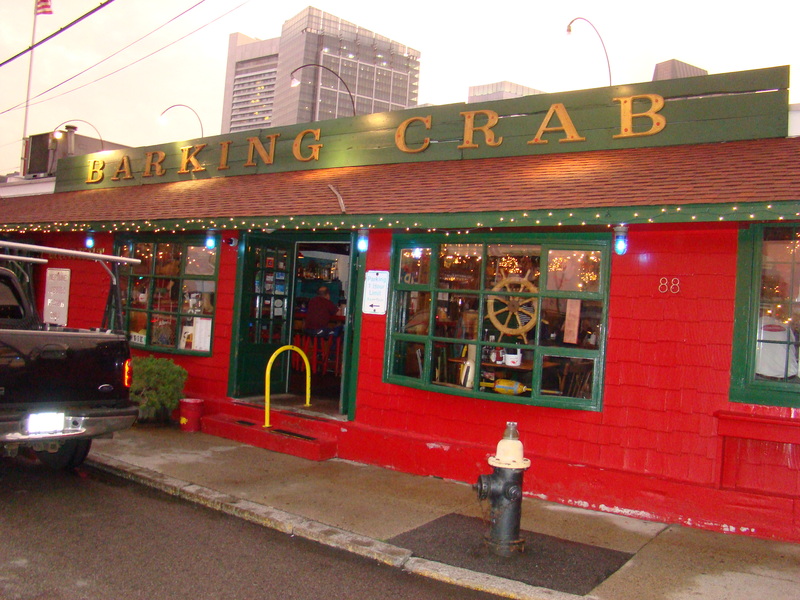 The Barking Crab has a second location in Rhode Island. The restaurant is consistently voted one of Boston’s best by Zagat, The Phantom Gourmet and Boston magazine. Visit their website at www.barkingcrab.com to learn more. It only took seven years, but taking a walk on the docks can be a great experience. Maybe it’s time you opened your horizons and tried something new, too. You’ll never know what you’ll find! A special thanks to our friends Jake and Stacey! This entry was posted in Cuisine - Seafood, Foodie Destination and tagged Adam Richman, Allston, Beantown, beer, Boston, Boston Children's Museum, Chronicle, clambake, Finale, Financial District, guppy bowls, Harpoon Brewery, Jake, Legal Seafood, lobster, Man v. Food, Mike's Pastry, Phantom Gourmet, Rhode Island, salmon, Sam Adams, Stacey, The Barking Crab, Zagat by Christina. Bookmark the permalink.